Today we have have a beautiful meatball recipe for you, make authentic Italian meatballs from home in less than 30 min! 1. 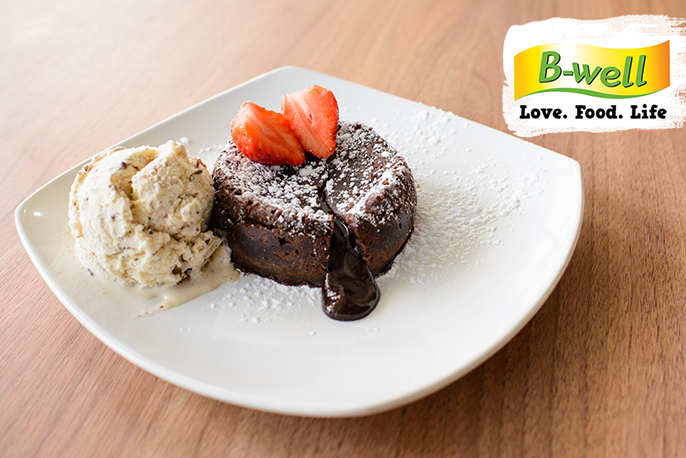 Combine all the ingredients in a large mixing bowl and mix them together thoroughly with your hands. 2. Scoop out about 1 tablespoon worth of meatball mixture and squeeze it several times to pack it tightly, then roll the mixture between the palms of your hands to form a 1 1/2″ meatball. 3. 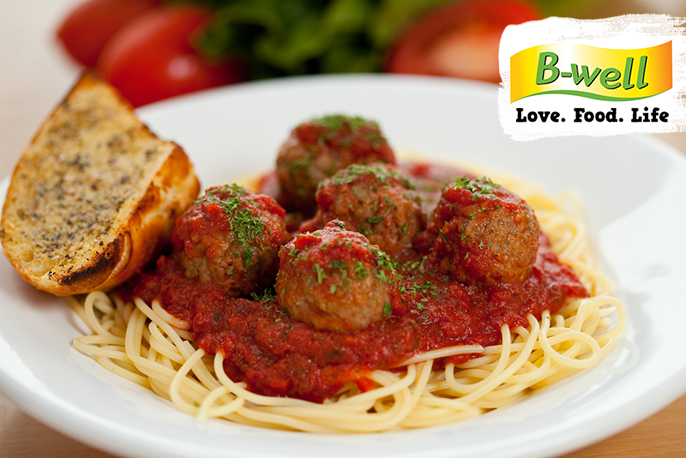 Arrange each meatball on a baking sheet and bake the meatballs at 200 degrees C for 10-12 minutes. allow the meatballs to cool down before trying to pick them up or they will break apart. Beautiful whole baked fish recipe, moist, flavorful and guaranteed to impress! If you are a bit squeamish, ask your husband to cook this dish while you enjoy a glass of white wine. 1. Mix butter, minced garlic and lemon juice together. 2. Place on a large piece of foil on large baking tray. 3. Butter foil where the fish will be laying. 4. Cut slits into the fish and season each cavity with the garlic, lemon butter mix. 5. Place thyme/rosemary sprigs inside each cavity and sprinkle the outside of the fish with salt and pepper. 6. Top with lemon slices. Fold edges of foil over fish; seal. 7. Preheat oven to 350°F. Bake fish until cooked through, about 45 minutes. Transfer fish to platter and serve! Crisp baked potatoes and/or a Greek salad would compliment this dish along with a glass of your favorite white wine. Viola! Beautiful whole baked fish for the family or a lovely dinner party dish. 2. In large pot melt butter, add onion and cook until translucent, about 8 minutes then add squash and stock. 3. Bring to a simmer and cook until squash is tender, about 15 to 20 minutes. 5. Return blended squash to pot. Stir and season with nutmeg, salt, and pepper. Voila! 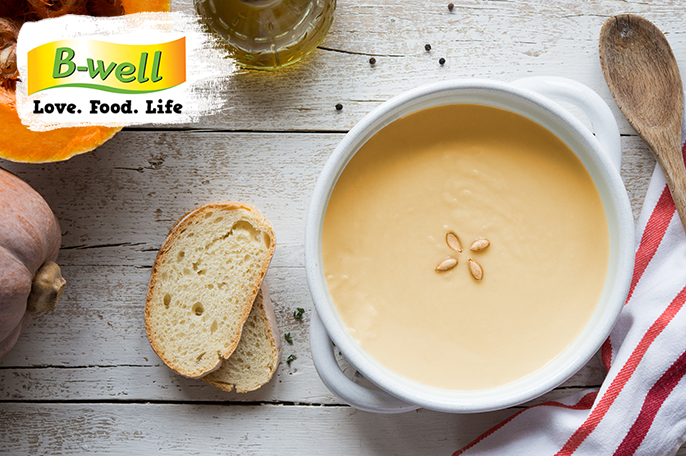 A lovely butternut soup to keep you warm during the cold winter months. 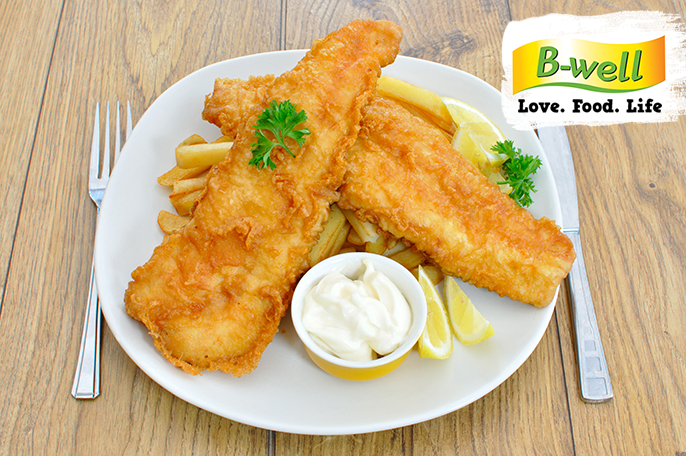 Do you love Fish and Chips? If so, this recipe makes the best batter I have ever tasted… Give it a try and let us know what you think! 1/2 Beer (optional) Beer may replace water. 1. Mix everything together and add the liquid slowly to insure the batter is not too runny. Reduce liquid quantity if needed. 2. Dip the fish in the batter and place the fish in medium hot cooking oil. 3. Leave the fish until golden brown and remove from oil to strain. Voila! Enjoy with your favorite condiment! Squeeze some lemon over your lovely deep fried fish and indulge. world… I made this last night for a birthday party and the prawns were absolutely amazing… Give it a try and let us know what you think! 2. Add butter, prawns and all the ingredients to a high heat frying pan. 3. Keep turning prawns every 20-30 seconds for 2 minuets. 4. Remove from pan and drip all the sauce over the prawns. Voila! Enjoy your succulent prawns with some rice and your preferred beverage. 1. Gently melt the butter & oil in a large pan which can be covered. 2. Add chopped carrot, onion, celery, bacon & bay leaves, gently cook until golden. 3. Add minced beef & garlic, season well with salt & pepper, cook until meat is no longer pink. 4. Add wine,cook until liquid reduces a little, add mushrooms thyme & oregano. 5, Add chopped tomatoes, the remaining ingredients stir well then cover and cook on lowest possible heat for a 2 1/2 hours. The secret to this dish is long, slow cooking as to allow the flavors to meld. 6. As this dish slowly simmers you will need to add more liquid; use either wine or a little water.I find a little wine does best. 7. 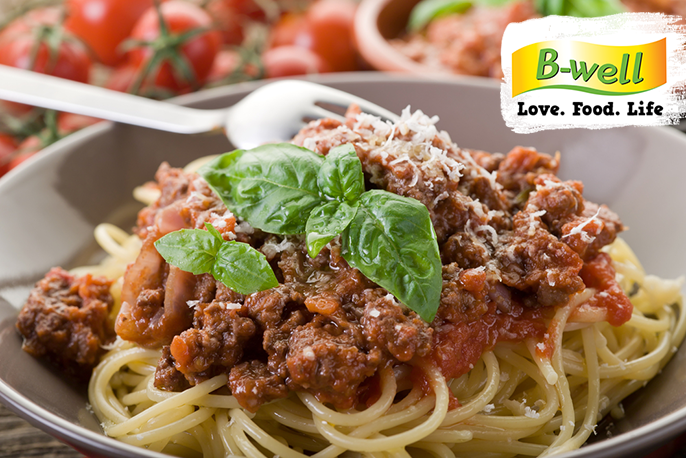 After two hours or so remove from heat, remove bay leaves, add 3 tbsp of B-well creamy gourmet mayonnaise, stir well, serve with hot pasta or spaghetti with fresh baked garlic bread and grated cheese.